When you deliver a presentation, you generally use a linear structure, which means that you tell a story, slide after slide, from beginning to end. However, people in the audience have to know how your story relates to them, why each point is important to their needs and wants. You can also inspire and motivate people by explaining how your message relates to the bigger picture, whether that means their entire company, industry, country, or the world. A standard sales technique is to explain benefits rather than features because benefits relate to what an individual can gain from a product or service. Nevertheless, let’s say you’re selling an expensive server computer. You can’t simply tell your potential clients that this server will be easier to maintain, cost less over the long run, and run faster. They will want to know why and how, so you’ll need to explain the server’s features in detail. Your sales presentation can go further by relating the value of the server to your clients’ overall company needs, which include meeting the competition, keeping costs down, keeping up with new technology, serving its customers effectively, and so on. You can even inspire your clients by providing a vision of the future of server technology in our society. A sales presentation is not the only type of presentation that needs to be relevant to an audience. Are you training employees? They want to know why each item that they have to learn is important to them as well as to the company. Summarizing a project or quarterly results? People want to know what it means and where it’s going. Any presentation will be improved by explaining the relevance of the content to the audience. But how do you explain both features and benefits, without going way over your allotted time? How do you explain the importance of a training session without distracting employees from your salient points? How do you add levels of relevance without adding confusion, increasing length, and sounding repetitive? After all, you don’t want to repeat yourself over and over. It seems that you need to create two parallel presentations that run at the same time—one presentation explaining the features of your product, service, course, or summary and the other, either simultaneous or intertwined with the first, explaining the benefits and relevance. On one hand, this sounds obvious. You want your audience to understand the relevance of your points as you deliver them. On the other hand, it sounds terribly complicated! You can use several techniques to create parallel meanings throughout your presentation, without increasing the length very much. But before you start, of course you need to think about these multiple messages and how they apply to your presentation. I’ll use an example of a presentation given by a consultant on the usability of a company’s Web site. The consultant used test subjects to look at the site and recorded their answers to questions, how they completed given tasks, and their overall impressions. In this case the consultant needs to report on the results of the testing process in detail which means explaining test subjects’ responses to specific pages. However, the consultant wants the company to understand three important points throughout the presentation—visual impressions, navigation, and unclear text all lead to confusion, dissatisfaction and, more importantly, fewer purchases. On a wider scale, the consultant wants to emphasize the importance of the Web site for the company’s overall business strategy. Therefore, the consultant now has three levels of meaning to impart—the specifics of the usability testing, the placing of each specific into one of three categories, and a broader message about the importance of the Web site itself. You should give your audience an overview of your presentation before you start getting into the nitty-gritty. This concept falls into the “tell ‘em what you’ll tell ‘em” principle. An overview lets your audience know what you’ll cover so that the details can fit into place more easily. They’ll understand and remember your presentation better with an overview. 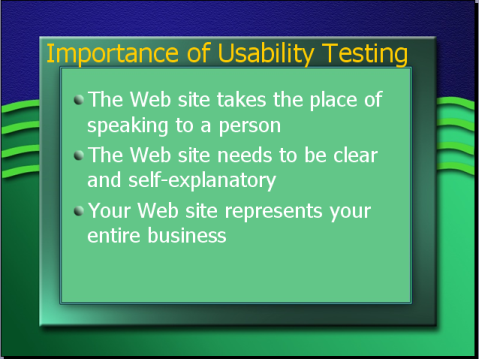 At the same time, the consultant can break down usability problems into the three categories and explain them thoroughly. 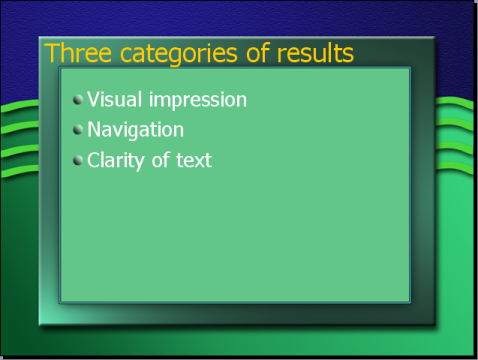 Here you see an example of a slide that covers these categories. One way to relate the presentation’s content to another level of meaning is to organize the presentation by the categories of meaning. 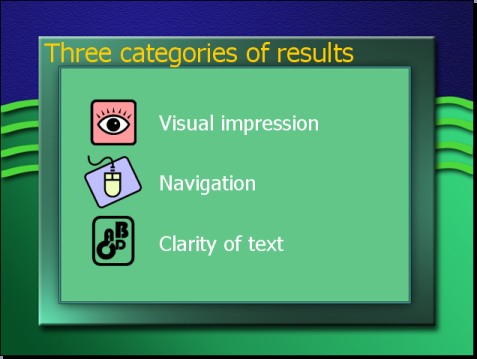 In the example presentation, the consultant can simply organize the presentation according to problems of visual impression, navigation, and lack of clear text. By clearly marking each section with a title slide at the beginning of the section or by marking each slide with the section name, the audience will automatically connect each problem with one of the three categories. Such an organization is not always possible. Perhaps the consultant wants to discuss one page at a time, although a page might have all three categories of problem. It might be necessary to cover the site according to the site’s organization so that the audience can more easily follow along. A second method is to use color coding or icons for each category. At the beginning of the presentation, when explaining the three types of problems, the presentation can introduce a color or icon next to each item. By pointing out this mechanism, the consultant can make this connection clear to the audience. From that point on, the presentation can display the appropriate color or icon next to the point being discussed and the audience will understand. Here you see an example using icons. You can use these icons throughout the presentation to indicate the category of usability problem you are discussing. The final method of integrating levels of content is more complex graphically, but more open to your creativity. You can visually show the levels, perhaps using shadows or 3-D images, to create the illusion of layers on the slide. In the example presentation, you might add a photo of a person, representing a user of the Web site. By adding a shadow, the photo would appear to be in front of the text. The person might appear confused, annoyed, or even angry, depending on the usability problem being discussed. For a sale presentation, you could use a happy customer (or a happy accountant) to show the connection between your product’s features and the company’s need to better serve its customers (or save money). In each case, you are relating the presentation to its real-life implications, because what you are saying will have effects on real people. Here you see an example of this technique. 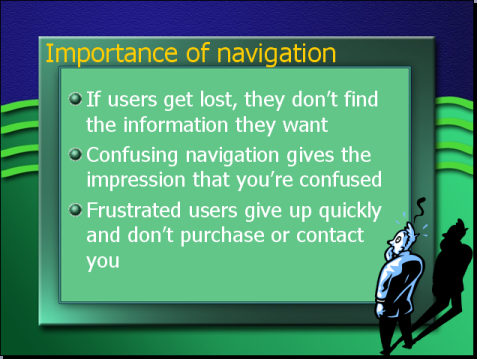 By placing a confused or annoyed Web site user in front of the text, you relate the content of the slide to real users who are sitting in front of their computer using the company’s Web site. You may decide to leave the level of the big picture to the beginning and the conclusion of your presentation. However, if this point is important for your presentation, you can use techniques similar to the ones I just discussed. Don’t create too many icons, colors, or levels—your audience can only remember so much. If you can integrate one level of meaning throughout the presentation and another with an overview, you will add a great deal of depth. When you summarize at the end of your presentation, you bring all the levels together. You repeat the points of your overview (“tell ‘em what you told ‘em”) and reiterate the relationship of all the details to your three main categories. Summarizing ties everything together and cements the relationship of the presentation’s content to the audience and the company.